Sleekly modern yet luxurious, the Novogratz Brittany Upholstered Bed will revamp your bedroom decor. 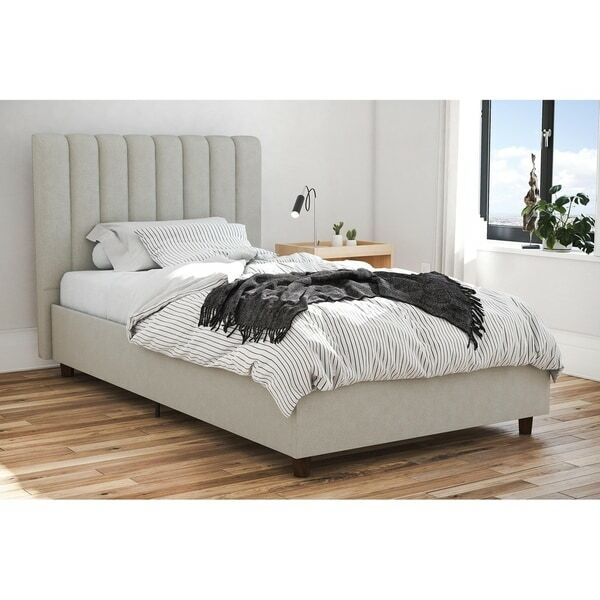 Available in grey, blue, or green premium linen upholstery, this bed features a tall headboard with ribbed tufted detail. The included bentwood slat foundation replaces a box spring and provides optimal support as slats adapt to the pressure exerted on them. I was skeptical about this purchase considering how inexpensive the bed was. I am pleasantly surprised so far. The bed came in two boxes and it took my husband about an hour to fully assemble it. We have been sleeping in it for about a week now and it seems to have great support and actually allows our mattress to operate at it’s full level of comfort. The color is true to the pic and fabric is linen. This bed came quickly. Easy to put together about hour 1/2 withny husband and I. It looks so modern and elegant at the same time. Im really hapy with it..its very sturdy as well. I just cant wait for my new mattress!! Shipping was timely, install went quickly it took me about 2 hrs by myself, and the green at first glance is a shade brighter that what I expected but once it was all together it looks great! Goes with everything and I was surprised how great the quality is for such an amazing price! I got the king & love it!!!! 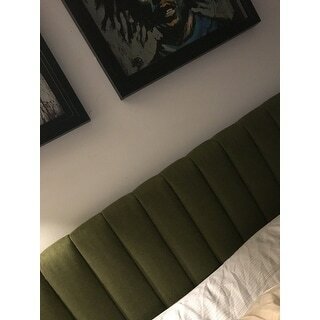 The bed was beautiful. Loved the fabric! I misread the height so I had to return but it was very nice for the price! "What height mattress is advised? " "how many slats come with this frame and what is the measurement between the slats in inches?" "what the under bed clearance height (from floor to bottom of rail) in inches?" "what the dimension of the slatted area where the mattress is placed?"